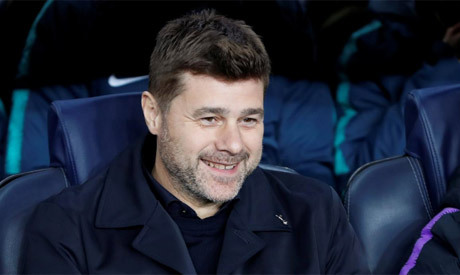 Tottenham Hotspur coach Mauricio Pochettino said his side completed “mission impossible” in the Champions League after they recovered from a nightmare start to qualify for the knockout stages with Tuesday’s 1-1 draw at Barcelona. Spurs were beaten 2-1 by Inter Milan in their first game, lost 4-2 to Barcelona in their second and threw away the lead to draw 2-2 at PSV Eindhoven in their third to leave them with only one point at the halfway stage of the group. Narrow home wins over the Dutch side and the Italians gave them a chance of going through, but their plight again looked bleak when Ousmane Dembele’s sensational individual goal put them on the back foot in the decisive game at the Nou Camp. Yet Spurs seized their place in the next round thanks to Lucas Moura’s late leveller, sneaking above Inter, who could only draw 1-1 at home to PSV, due to a better head-to-head record. “I’m so happy, so proud, I remember that after PSV no one believed in us, it was mission impossible, but we are here, we’re in the next round,” Pochettino told reporters. Tottenham’s hopes of staying in Europe’s elite competition looked doomed when news filtered through of Mauro Icardi’s leveller for Inter. “It was difficult to manage the last 10 minutes. The players knew the result (score) of Inter but it is difficult to translate what to do to the field,” he said. The coach also said reaching the last-16 from a group containing two giants of the competition was among his greatest achievements with Spurs since taking over the club in 2014. “It was so difficult to manage everything inside but we made a fantastic effort. To see and celebrate with everyone after four years and a half was great, it was the first time I felt something really special,” he said.